Hey guys, as you may have seen, there have been many Maggie’s Posters that have been put up. The reason for this is that the Leadership Class has been partnered up with Mr. Barrett, as well as some of the clubs at our school to put on Maggie’s Mission. It is to spread awareness of childhood cancer, ovarian cancer, and the love and unity that HF Family stands for. In honor of a lovely member of our family who passed away last year on June 1st 2017, Maggie Schmidt. In honor of her memory, her family has opened up an organization, and launched Maggie’s Mission. It’s for a good cause and to purely spread awareness, although financial donations will be greatly appreciated on their website www.maggiesmission.org. Since Maggie did attend Harborfields, we took it upon ourselves to cater mission to a level that high schoolers could participate. There will be many activities going on, at home, at school and in class activities. The at home and ar school activities will commence next week, Nov 13th- Nov 16th and cannot run without your full support! 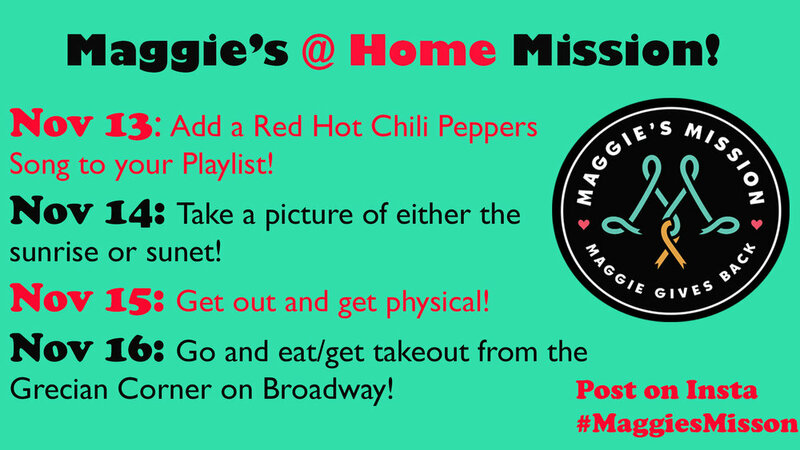 Some at school activities will be TEAL DAY ON TUESDAY NOVEMBER 13th, as well as the at home mission of adding a red hot chilis pepper song to your playlist and posting a picture on your instagram #MaggiesMission to inspire others to participate. On Wednesday we will be running the in-class activities as well as the at home mission to take a picture of either the sunrise or sunset. On Thursday we attempt to bring a refreshing day to Harborfields, where it will be a No Tech Thursday where students will be presented with the fine mission of not using their phones for a day. Say hi to a person you never talk too, and as for teachers who are able to, not use smart boards. with the at home mission of getting out and getting physical. Then we wind down on Friday, playing nice Red Hot Chili’s Peppers song on over the announcements, as they were Maggie’s favorite band. With the at home mission of buying or eating takeout at Grecian Corner where Maggie used to work at. Through these messages we are uniting for a greater cause, to keep Maggie’s Memory alive. Activities for Maggie's Mission will begin on November 13th and end on November 16th. take a picture of each of them, post it to your Instagram story, and #maggiesmission. Maggie's Mission is our mission, let make everyday count!